I’m the type of girl that likes to think things through, especially when it comes to shopping. So when I got the opportunity to try out the Verizon network as one of their Ambassadors last summer, I geeked out. Verizon hooked me up with some great tech including a Samsung S5 and Ellipsis tablet, and of course, their network. It was great. In fact, I wanted more. As a Tejana road warrior, I use the heck out of my wireless service while cruising what I like to call the Texas Triangle (Dallas, San Antonio and Houston) and beyond. I need mucho gas and mas data.I also like having a variety of tech. So, a few miles into the Ambassador program, I found myself in a Verizon store checking everything else they had to offer. Normally, I would take it all in: the latest phones, the service plans, the accessories etc. But, then I learned about the Verizon Edge offer and just like that, no more thinking required. I was in data plan cruise control. 1. I did not have to pay for my phone. At least not that day. The phone cost is broken up into 24 payments and included in your monthly plan. It’s like lay-a-way for your phone. I now have an Android with my Samsung S5 and a new iPhone 6 plus! Ah, variety. 2. I got a $150 credit per line. My hubby was still on our former service provider so this was the perfect opportunity for him to also join Verizon. This offer is still going on for a few more days. Check it out, it’s pretty sweet. That’s right, Edge has single or family data plans. The Edge offer gives you the option to upgrade every year. This is big because in a year, there WILL be a new must-have phone. As far as the service plan, I picked the MORE Everything plan that saves you up to $25 monthly per line on Verizon Edge smart phones. Again, this offer goes for just a few more days. And also, at least for me, the Edge family plan costs less monthly than I paid with my former provider. Plus, I really lucked out because I got a free tablet with my hubby’s line AND get this, we got an additional $400 credit for bringing in two old (but working) smart phones! Guys, I got $700 total in credit just for getting on this plan. For the record, I don’t know if they are still offering the smart phone credit or free tablet but I encourage you to look into any offers that might be going on. Oh wait, I almost forgot. My brother-in-law heard about our Edge experience and he decided to switch his family over. Verizon has a referral program too, so in short, we each get a $25 Verizon gift card. Most importantly, I feel good about having lots of fast data and cell service I can depend on. If you are the type to think (sometimes over think) things, and cell service is something on your mind lately, hopefully this post will help you decide if Verizon is right for you. 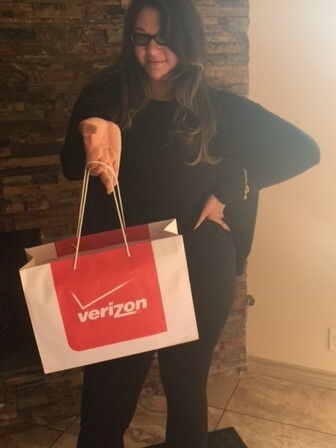 I am a Verizon Ambassador and receive products as part of the program. All opinions are my own.